Small Beer Press, 9781931520546, 280pp. In this exuberant and hilarious debut reminiscent of The Life of Pi and Then We Came to the End, an episode of furniture moving gone awry becomes an impromptu quest of self-discovery, secret histories, and unexpected revelations. Thom is a computer geek whose hacking of a certain Washington-based software giant has won him a little fame but few job prospects. Erik is a smalltime con man, a fast-talker who is never quite quick enough on his feet. Their roommate, Tree, is a confused clairvoyant whose dreams and prophecies may not be completely off base. 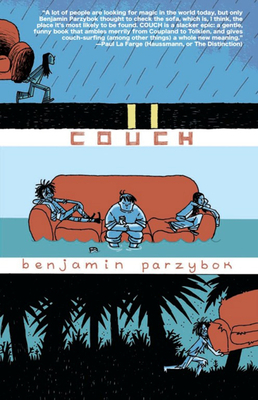 After a freak accident fl oods their apartment, the three are evicted--but they have to take their couch with them. The real problem? The couch--huge and orange--won't let them put it down. Soon the three roommates are on a cross-country trek along back roads, byways, and rail lines, heading far out of Portland and deep into one very weird corner of the American dream. Benjamin Parzybok is the creator of Gumball Poetry, a journal published through gumball machines, and the Black Magic Insurance Agency, a city-wide mystery/treasure hunt. He has worked as a congressional page, a ghostwriter for the governor of Washington, a web developer, a Taiwanese factory technical writer, an asbestos removal janitor, and a potato sorter. He lives in Portland, Oregon, with the writer Laura Moulton and their two children. Benjamin Parzybok created a journal published through gumball machines (Gumball Poetry) and a city-wide mystery/treasure hunt (Black Magic Insurance Agency). His previous jobs include: ghostwriter for the Governor of Washington state, web developer, Taiwanese factory technical writer, asbestos removal janitor, potato sorter, and congressional page. He lives in Portland, Oregon, with the writer Laura Moulton and their son.